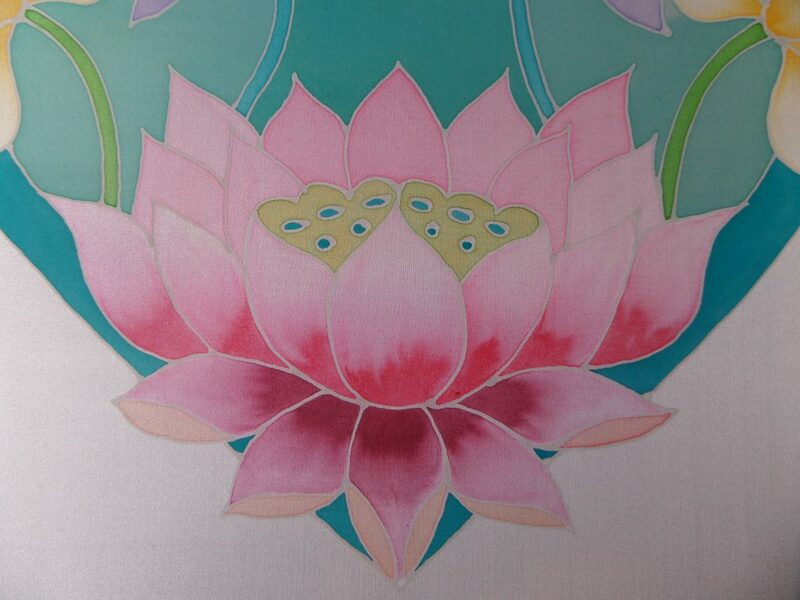 Lotus flowers are enjoyable to paint on silk , I thought it would be good to show how to blend paints to achieve an easy, but effective dark to light effect. 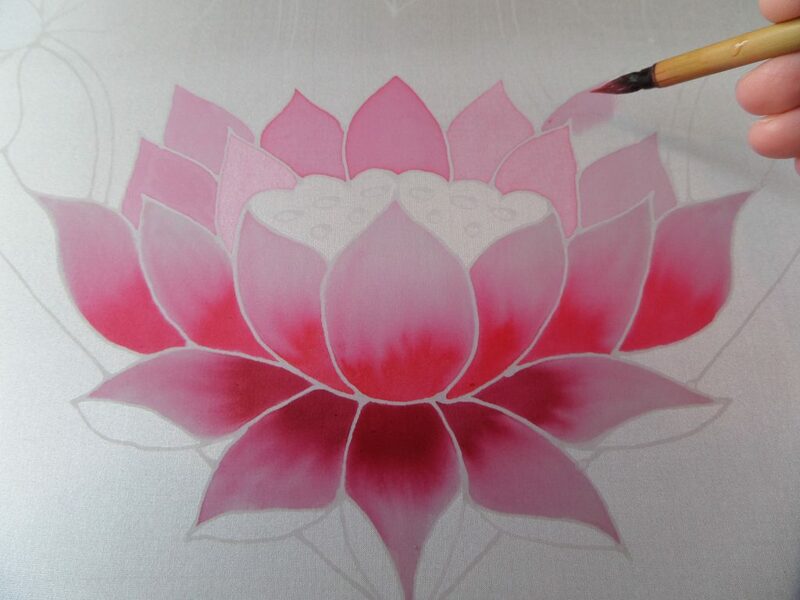 Firstly paint water onto your petal, not too much , just a flat surface works best. 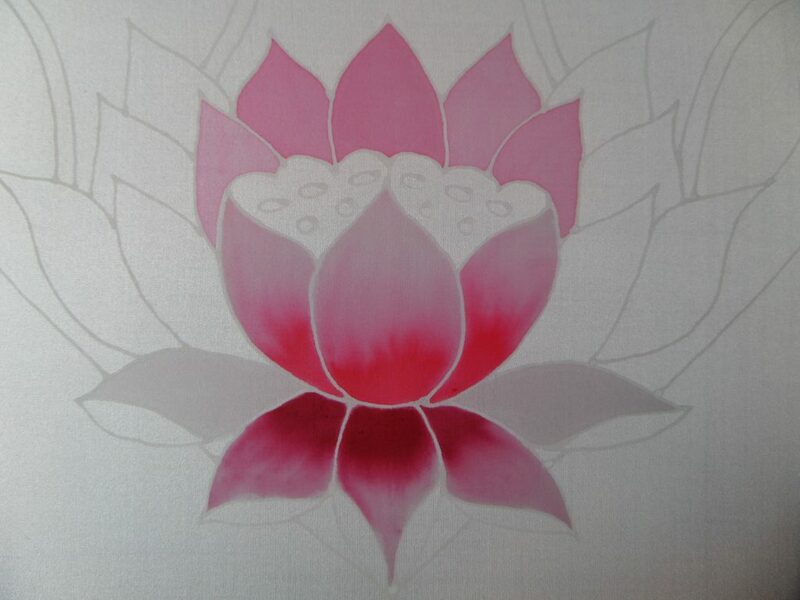 I’m using Pebeo setasilk paints, this colour is called Plum. 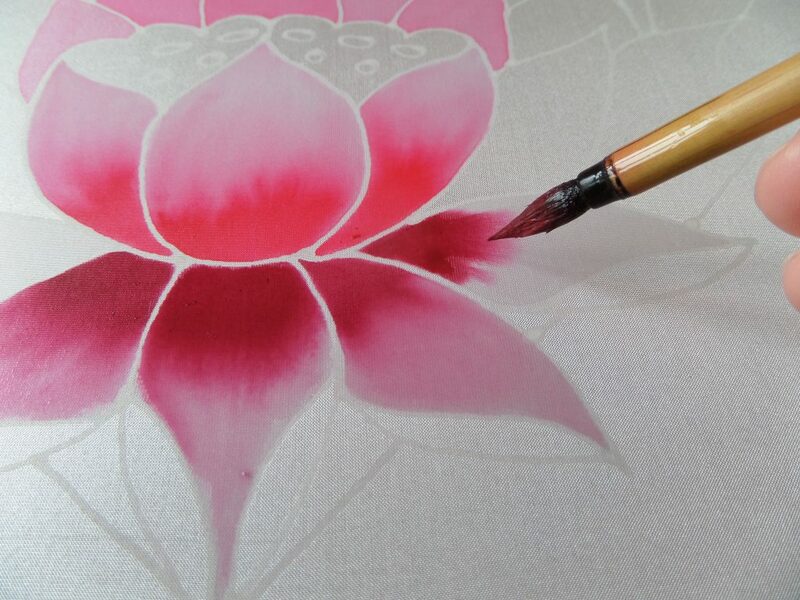 Apply the concentrate plum about a third of the petal. I’ve applied it at the base of this flower ,but you could apply in the same way from the tip. 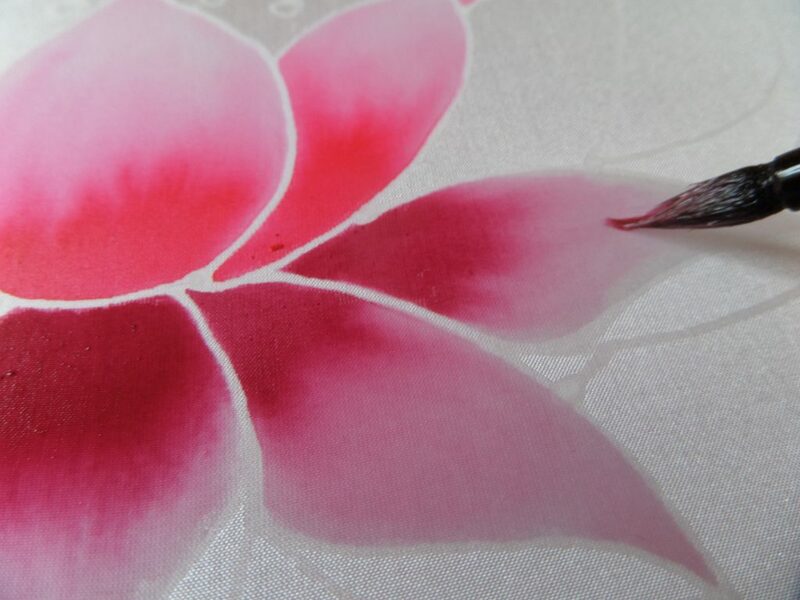 Wash your brush after applying the concentrate and wipe on tissue paper, then with quick careful strokes work the plum to the tip of the petal. It is important to work the plum from the middle of the petal, leaving the darker shade undiluted at the base of the flower. This colour is magenta and gives a good pink colour when diluted. The brush is a chinese, natural wolf hair from Guanghwa .com and gives good control with a good point. 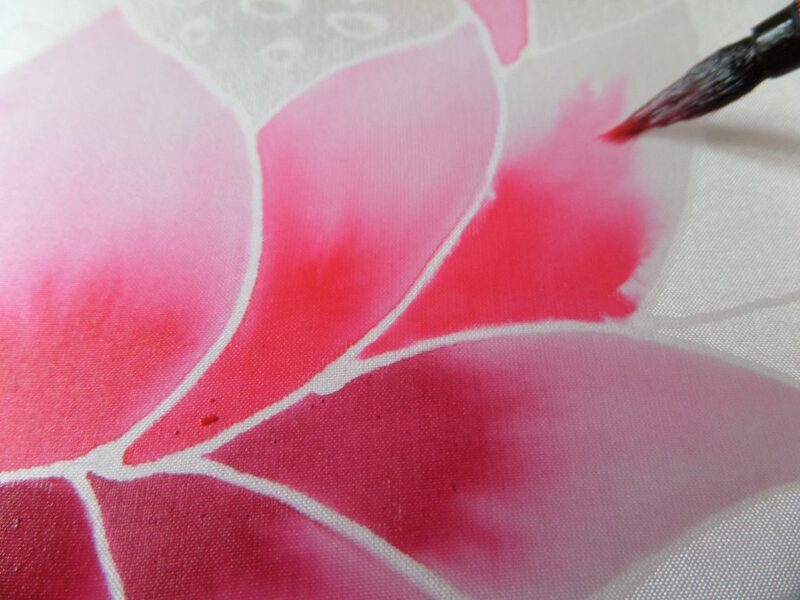 I’ve diluted the magenta and am painting the pale pink on dry silk. 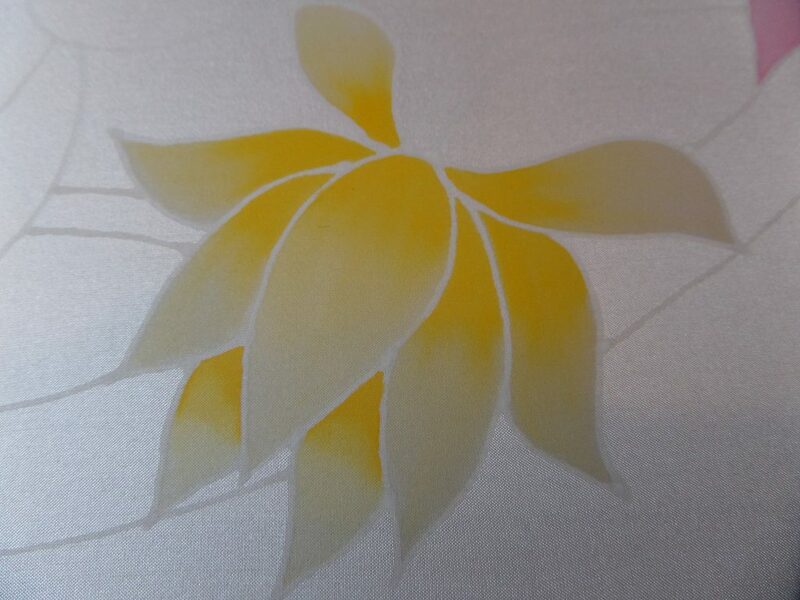 Same technique using ‘buttercup’ setasilk. 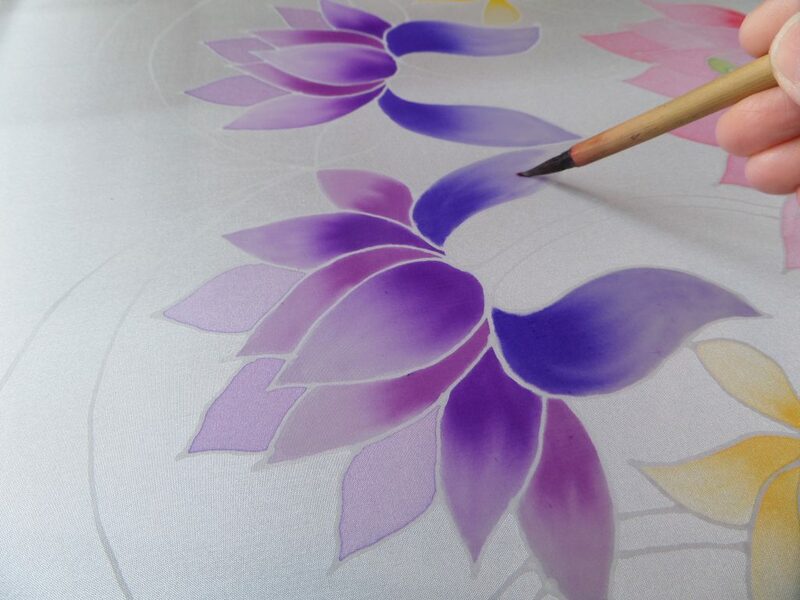 Working the concentrate to the tip to get seamless shading from dark to light. Combinations of ‘gitane blue’ and ‘iris violet’ work well together here . These dyes give lovely pastel shades when diluted. Starting to apply the background paint , a mixture of ‘turquiose’ and small amount of’buttercup’ to make a duck egg colour. 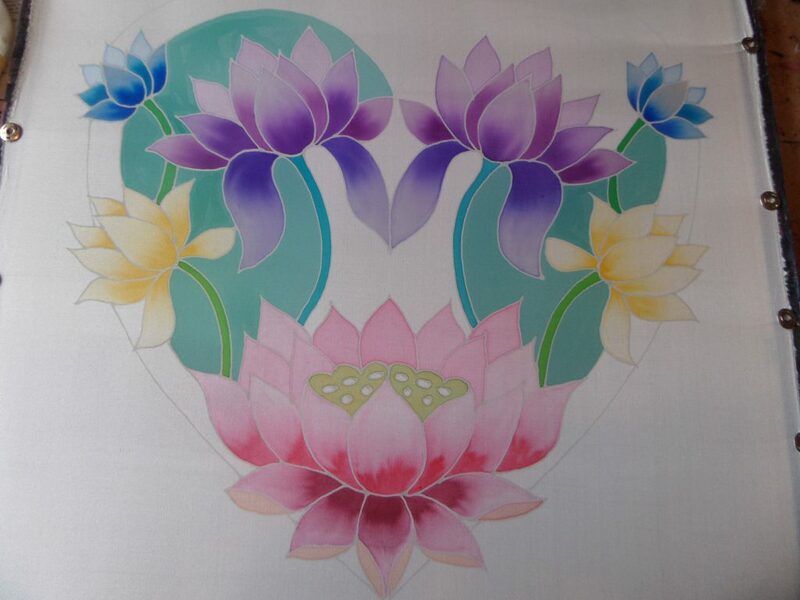 Design complete just need to choose a colour for the background. 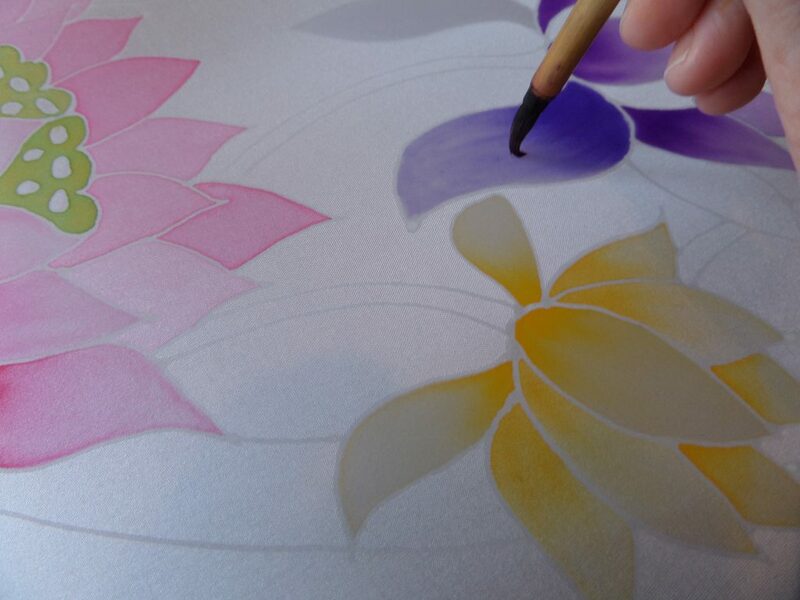 I decided a dilute ‘gitane blue’ with sea salt would give a contrast to the smooth lotus petals, although I was tempted to leave it white for a while ! 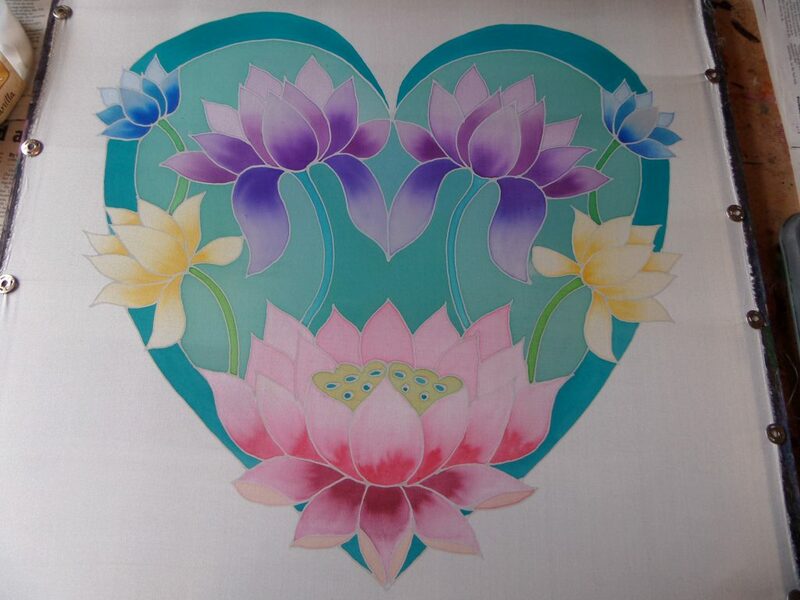 I’ve been busy making a whole collection of heart shaped designs to use in my workshops at Center Parcs,Longleat , featuring flowers, birds and trees with lots of fun colour potential , do come and see if your visiting this summer! 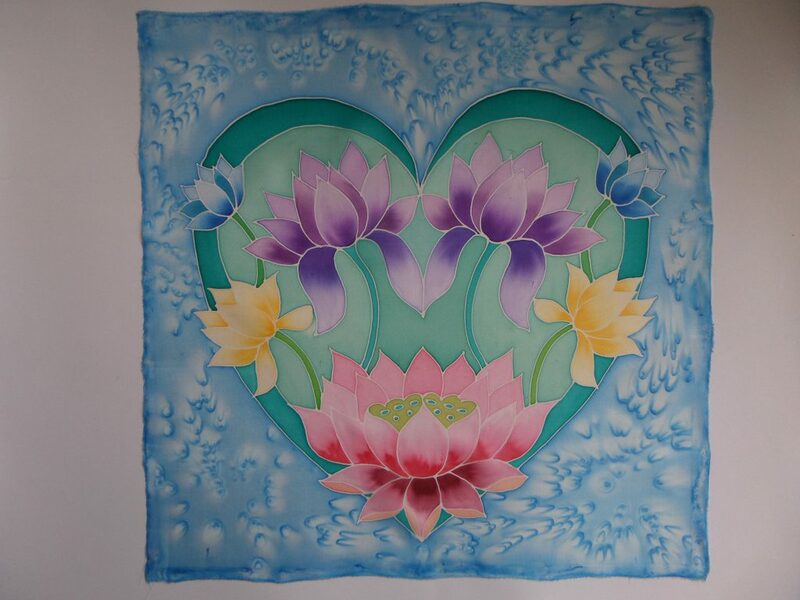 Previous Previous post: Hearts, Birds and Flowers.